Everyone has their own story about Dark Souls. What's yours? As promised, here’s a whole other episode in the same week! And look who it’s with: Gary Butterfield! You might know him from Duckfeed.tv, Watch Out For Fireballs, or Bonfireside Chat. Gary and I sit down and talk about the real issues: why did it take him so long to play Dark Souls? I’ll let the rest come out in the episode. Enjoy, skeletons. That’s right, skeletons! This week is yet another TWOFER week on Don’t Give Up, Skeleton. The first episode is my interview with Kole Ross, who definitely doesn’t need an introduction. You all know who he is: Watch Out For Fireballs, Bonfireside Chat, Duckfeed.TV. Kole was nice enough to sit down with me and talk about his journey through the Souls series, and some other lesser known FROM Software games. Enjoy the episode, and Watch Out For Another Episode Soon. Welcome back, skeletons! 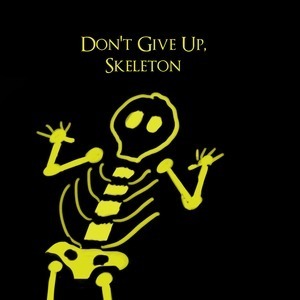 This week is another great Don’t Give Up, Skeleton. 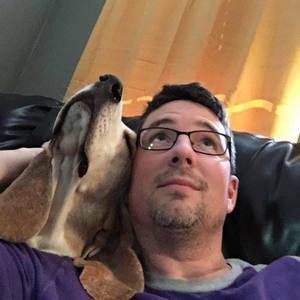 Robert is a podcaster and game reviewer living in England. We had a lengthy conversation about all things Souls, and even spend some time going into some older From Software games. I think you’ll like it! Hello again, skeletons. This week’s guest is AllisonByProxy! If you’v been paying attention to the Dark Souls community for awhile, you probably have heard of Allison or seen her work. She created LegoDarkSouls, has guested on multiple episodes of Bonfireside Chat, and is an all around great person. We talk about her Souls origin stories, and just how great all of these games are. It’s a good episode, so strap in, folks. A new episode, skeletons! Cast yourselves back to the week of E3 2016. Myself and Paolo, this week’s guest, jump on a microphone and start talking. The first thing I learn is that he’s a graphic programmer for Sony Santa Monica, and that he’s working on God of War. The second thing I learn is that he worked on Firewatch as well. The third thing I learned is that he LOVES the Souls series. We’ve had some enthusiastic guests on before, but Paolo is on a whole new level. This is one you’ll enjoy. We’re back skeletons! This week we are joined by Liam, a delightful Australian who loves music and Dark Souls. We immediately get off topic into some music talk, but bring it around back to Souls quickly enough. I need to toss an all caps WARNING into the notes for this one, since Liam talks about some pretty dark times in his life. If you are sensitive to talk about alcohol abuse, you might want to skip this episode. That’s right, this week’s guest is the second founder of YouDied.co.uk, Gav Weir! We talk about everything Souls, as usual, starting with the lack of a thorough Dark Souls wiki. I promise, it’s explained in the episode. Be warned, Gav and I apparently suffered some major memory loss during this episode, as neither of us were able to remember some pretty common names. It happens, folks. Skeletons! Today’s guest is Gav Russell, one of the two people behind YouDied.co.uk. Gav and I share a very hungover conversation that is none-the-less chock full of jokes and chat about Dark Souls, and probably a bunch of other stuff too (look, I said I was hungover, give me a break over here). Welcome back, skeletons! The guest for episode 21 is Suvesh. He doesn’t have a lot of history with games, but when he came across the Souls series for the first time he was hooked. He went on to play all five games so far within a year. A year! That’s crazy. Enjoy the episode! Hello skeletons! This week’s guest is Fiona, a name you probably aren’t familiar with. Despite playing FROM software games with her brother since the PS1 days, she hasn’t really had a presence in the Souls community. I have a feeling that’s about to change, though. Fiona and I chat Souls for awhile, and then she starts laying down some serious lore. Hello again skeletons! We’re back with another episode of Don’t Give Up, Skeleton. This week’s guest is my good friend Layne, who I met on (you guessed it) on the Duckfeed Slack. We talk about all sorts of Souls, being a dad, and probably some other stuff as well.